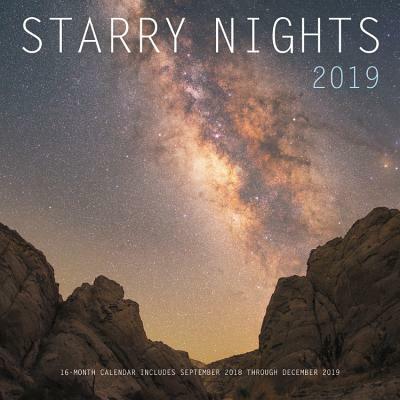 Take in the ethereal beauty of the night sky all year with Starry Nights 2019, a 16-month calendar featuring full-color shots of the cosmos from exciting earthbound locations. With the 13 stunning images of this calendar, follow photographer Jack Fusco as he takes you from Wyoming to Iceland, trekking across plains and perching on cliffs to achieve compelling shots of the stars in all their glory. Stargazers won't miss any heavenward happenings with this 12" x 12" wall calendar—its grid includes major meteorological events and sky-watching festivals. Full of quiet beauty, Starry Nights 2019 will inspire you and stimulate your mind all year round. Jack Fusco's photography started purely as a way document travels throughout the United States and Europe, but it has become a main form of creative expression. Too often we pass by natural beauty or fail to appreciate the things we are surrounded by every day. Through his photography, he hopes to preserve what has been forgotten and renew wonder for that which we have grown accustomed to. Recently, his work has focused on the landscape-astrophotography field. This style of photography takes many notes from both astronomy and traditional landscape photography and then combines the two. Hours are spent planning shots out days, weeks and sometimes even months in advance to make sure all of the elements align properly. Being able to capture the sense of wonder and vastness that we can feel while staring out in a star-filled sky is a feeling unmatched. Jack's photography has been featured by and received awards from: The Weather Channel, NASA Astronomy (Picture of the Day), Chasing New Jersey, Yahoo! News, EarthSky, National Geographic, and the LA Times.